The world runs on goods and products that are shipped all over the globe. These products are usually shipped and stored in large quantities, making their transportation and storage that much more important. A public warehouse is a single company that concentrates on warehousing and distribution. Public warehousing can be a great solution for any company that sells a vast quantity of products and requires a warehouse to do so. Their services can include numerous ways to store goods based on environmental needs such as cold storage, humidity control, refrigeration, and so on. Depending on the company, there should be multiple options for shipping methods for your products. Public warehousing is something that can be very accommodating regarding space. As your company grows and expands, the amount of space you need will also grow, making the decision of public warehousing that much more necessary. Public warehouses usually offer advanced technology that is not often used by smaller businesses. Due to the shared cost across multiple organizations using the same warehouse, the use of such technology is much more attainable and can be extremely beneficial. It’s always good to have a plan, and searching for a public warehouse is no exception to that rule. Research is a big part of finding the right fit for your company, so be sure that you are thorough. Treat this search as you would any other large purchase, and get different perspectives to make your decision easier. When you put in the time and effort into selecting the right public warehouse, it will yield great results. Another thing to be strategic about is the location. Try not to be set on a specific geographical area the way you would be for a facility location. There are no rules that state your public warehouse needs to be in a specific area. Choose what works best for your customer’s needs. Since your goal will always be to grow your business in new and interesting ways, it’s important to keep in mind that plans for expansion should play a large role in your decision. You don’t want to be continuously searching for new warehouses every time your business grows, requiring you to have more space. Speak to a representative from the warehouse, and inquire about the capacity it can handle and what would be done if you require additional space in the future. If a particular warehouse is going to make it difficult for you to expand, then it may not be the best fit for your business’s needs. A warehouse’s ability to provide essential systems support is imperative to a cohesive business model. You want to be sure that you are getting the systems capabilities that your business requires to support your product and inventory needs. Without these support systems, it could impact your business, which is never a good thing. Whenever you are going to trust another facility with your business you want to be sure that they have a good reputation. 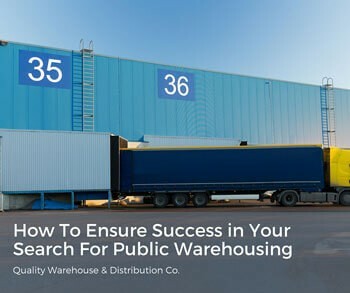 Most public warehouses will try their best to win your business, but it is your job to do your research. Talk to independent sources who don’t have any specific interests in your choices. Third-party opinions can help in your decision, especially if they are customers of the facility you are considering. Ask for specific examples of how they have handled products in your industry, and go from there. If these check out, then it could make your decision that much harder or easier as you weed out which public warehouses are the best fit for you.